I read this book last week. It took me about five hours. It was that good. And yes, it has the cheesy love triangle business that, since the Twilight series, seems to be a required element of Young Adult Lit. But that pesky love triangle doesn’t overpower the true message of the book: what is the consequence of yielding choice to the government? True, the society in in Matched has eradicated disease and on the surface, its citizens appear to be happy. But they really aren’t happy, they just…are. It’s a frightening look at how our lives would be if we weren’t allowed to make our own choices, from what food we eat to how hard we exercise to who we marry. The friend who lent me the book (which I have since purchased) said, “You have to read this! It was written by a former English teacher, and you’ll totally get it!” She’s right–I did. I love Dylan Thomas, and his poetry is featured throughout. But that wasn’t the only thing I got. The author is LDS, and the theme of choice was not lost on me. A scripture from The Book of Mormon reads “For it must needs be, that there is an opposition in all things. If not so…righteousness could not be brought to pass, neither wickedness, neither holiness nor misery, neither good nor bad…” (2 Nephi 2:11). This, for me, was the larger message in Matched. Condie created a dystopia where people don’t seem to emote. Scarier still are the freedoms they apparently willingly handed over to the government. I do think government can accomplish amazing things–look at car safety, for example. Standardizing the speed limit and requiring seat belts have decreased highway accidents and deaths. But some things we should probably be able to choose for ourselves despite negative consequences. One small example: if people want to live on Twinkies and Coke, then they should suffer the consequences, not sue Hostess or call for Congressional oversight into the American diet. I have a lot to say about this book, but don’t want to spoil it for you. Read it. Let me know what you think. Or don’t read it. It’s your choice. ← Previous Post My Last Week. I keep seeing that and wondering if I really want to pick up another sci-fi-government-takes-the-life-out-of-people book. Maybe I'll check it out after all. Seriously, what's up with the love triangle business? I noticed this too. 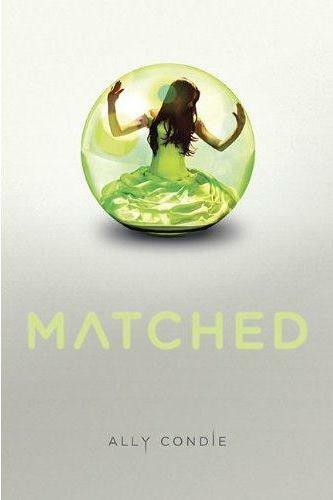 It's similar to the Hunger Games Trilogy although I liked “Matched” better. That being said, I didn't love Matched, but it's not bad. I saw this at the library today and loved the cover. Now I'll have to give it another look. Thanks for the review. btw, I'm a longtime reader but rarely comment. I'm LDS & live in Lincoln. Sherpa–I still haven't finished Mockingjay. Catching Fire was so good, but so graphic that it gave me nightmares. My only complaint about Matched is how obvious the setup for the trilogy is. I know people have to make a living, but can't a story just be left alone? Just read it. I loved it! It did feel a little bit like The Giver from a teenage perspective or maybe a prequel. I do like the comments about wanting to choose just one thing turning into wanting to choose everything. It's a good argument for why there can't be a compromise.